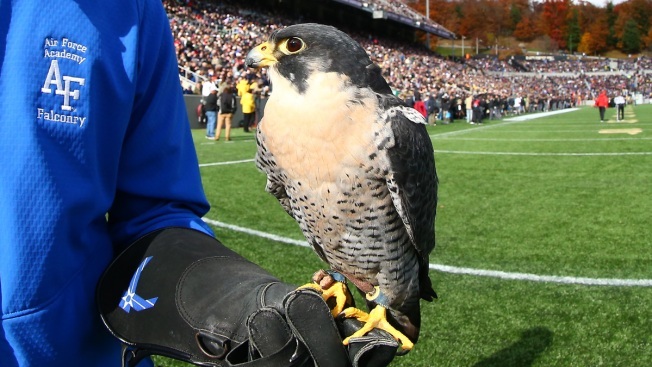 Falcon Mach 1, one of the Air Force's official mascots, is seen during the second quarter of the College Football Game between the Army Black Knights and the Air Force Falcons on November 3, 2018, at Michie Stadium in West Point, NY. Aurora, the falcon that was injured during a prank before the annual rivalry football game against Army, is recovering back in Colorado, but her long-term prognosis is unclear. 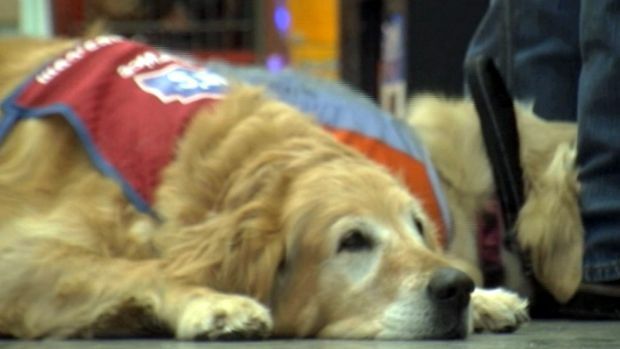 It's "Bring Your Pet Day," every day at a Texas Lowe's, who hired Air Force veteran Clay Luthy, as well as his service dog, Charlotte, for a job at the home improvement giant. Charlotte, Luthy said, has become a customer favorite just two months into the job. Sam Dollar, Air Force's falconry team adviser, told The New York Times on Sunday that two West Point cadets took the birds, threw sweaters over them and stuffed them into dog crates. Dollar said the cadets turned over the birds Saturday morning, with Aurora's wings bloodied — likely from thrashing inside the crate.